Search.myweatherxp.com is a malicious third-party search engine that cannot be trusted under any circumstances. Our reports show that quite a few users have their system infected with it. If, unfortunately, you are one of those users makes sure to remove it as soon as possible. In most cases, Internet users get their PC infected with this invasive search engine as a consequence of lacking basic virtual security knowledge. Within this article, we will discuss ways that you can avoid getting your PC infected with Search.myweatherxp.com or a similar infectious application and how this malicious search engine functions and why it should not be trusted. Below we provide a detailed removal guide that every user should use without any hesitation since it is your best bet to delete Search.myweatherxp.com in no time. If you wish to improve your virtual security, there are a few preventative steps that you should take. During the research, we have discovered that in most cases Search.myweatherxp.com is distributed via bundled installers. The best way that you can reduce the risk of getting your PC infected in this way is by staying away from various third-party download websites or websites associated with online piracy, since such sites are known to be the primary source of software bundles. Additionally you are advised to always choose the advanced installation because you will be presented with maximum information regarding the setup processes. This way you might be able to cancel the installation of a potentially unwanted application. Of course, the only sure way that you can ensure your virtual security is by implementing a reliable antimalware tool that would provide overall security to your PC at all times. The primary indication that Search.myweatherxp.com is up and fully running on your operating system is a change of your default browser settings. All the changes will take place without any notification. The changes include the alteration of your default homepage and search engine. It goes without saying that such changes will affect your online experience to put it mildly. You will be forced to use the suspicious third-party instead of the one you prefer. Besides that, each web browsing session will start on a homepage that you did not set as default yourself. All of this will only make browsing the web a frustrating and annoying experience. These changes will remain as long as Search.myweatherxp.com is active on your operating system. Unfortunately, the removal of a malicious browser extension of this search engine will not restore the default browser settings. The only way that you can restore the default settings of your web browser is by executing a complete removal of Search.myweatherxp.com. 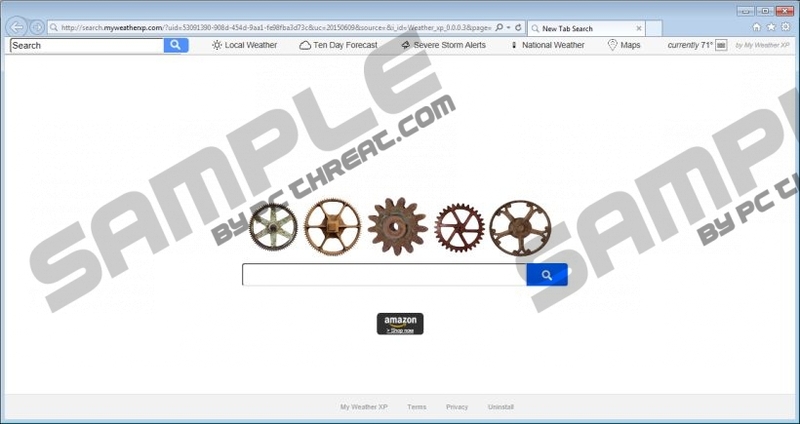 The removal of Search.myweatherxp.com is a two-step procedure as first you will need to delete the malicious browser extension and then you will need to remove it via Control Panel. Do not skip any steps as a single mistake could mean that the infectious search engine was not removed entirely and could still be active on your PC. If you want to avoid such instance, you are firmly advised to scan your PC with a professional antimalware tool since it would identify and remove any leftover files or registry entries associated with Search.myweatherxp.com. Click the Remove button to delete the unwanted extension. Quick & tested solution for Search.myweatherxp.com removal.